1 AM Update: The temperature is still 85°; the new record high minimum goes into the books. Midnight Update: The midnight (EDT) temperature is down to only 85°, so the record high minimum will most likely hold. 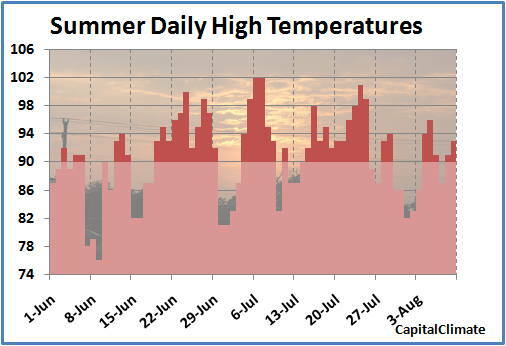 Today's preliminary high/low temperatures of 97°/80° at Washington raise the summer average to date another notch to 81.9°. The August average is now 82.0°, 3.2° above average and the second hottest August in history. There have now been 51 days of 90°+ temperatures this year, 46 of them this summer. 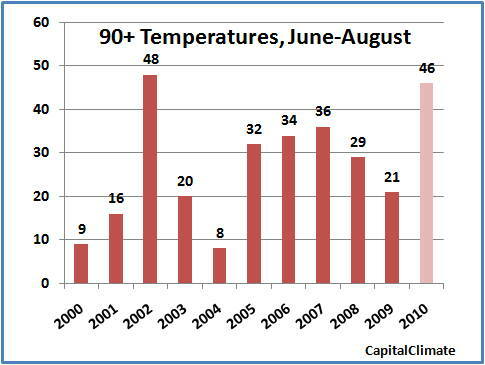 The summer total is now within 2 of the amount in 2002 and more than double last year's. 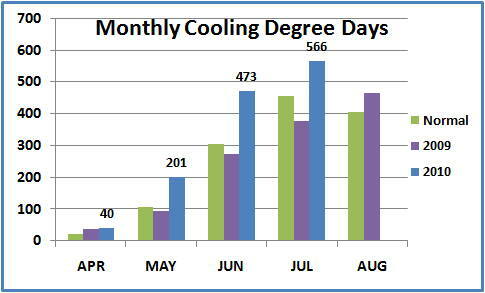 The record for a calendar year is 67 in 1980. The high missed the daily record by 3°, but the low, if it holds through midnight (1 am EDT), will break the old record high minimum of 78°. 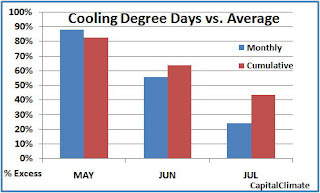 If it occurs, this will be the 4th daily low of 80° or higher this summer, the first time there have been more than 3 80°+ lows in the same year. In all, there have been only 28 such lows since records began at or near the current location of National Airport in 1930. The highest was 84° on July 16, 1983. If no rain showers lower the temperature, as seems likely from the current regional radar, the record will undoubtedly hold. Interestingly, however, on July 20, 1981, an impressive 0.76" fell within the 2 hours of 7 to 9 pm (EDT), but the low temperature for the day was still 80°. The high of 97° at Washington Dulles was enough to beat the old record of 96° in 1980. Records at Dulles extend back to 1962. Wallops Island, VA, which also has a relatively shorter record (since 1963), beat the old record of 92° in 1977 with a high of 97°. Today's preliminary high temperature of 98° at Washington ties the record for August 10 set in 1943. Along with the low so far of 76°, this brings the August monthly average to 81.4°, which is 2.5° above the long-term average. The summer average to date is 81.8°. The high of 97° at Baltimore was 3° short of the record, and the high of 95° at Washington Dulles was 2° below the record there. The downtown Baltimore high was also 97°. The high of 97° at Salisbury, MD tied a record set in 1977 in a temperature history dating back to 1900. The high of 99° at Georgetown, DE broke the record of 98° set in 1949. Georgetown records began in 1948. 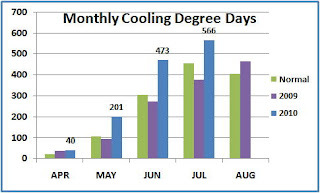 This is the 45th summer day with a temperature of 90° or higher and the 50th of 2010 including the 5 in April and May. The record is 67 days of 90°+ in 1980. Following a slight break on Saturday (high 87°, low 68°), Washington, DC's summer was back on simmer by yesterday with a high temperature of 91°. After readings of 92° for 4 consecutive hours, it was likely that today's high would be warmer than that, and in fact the maximum so far is 93°. Meanwhile, the low so far of 75° is 5° above the forecast, and that is likely to hold through midnight. 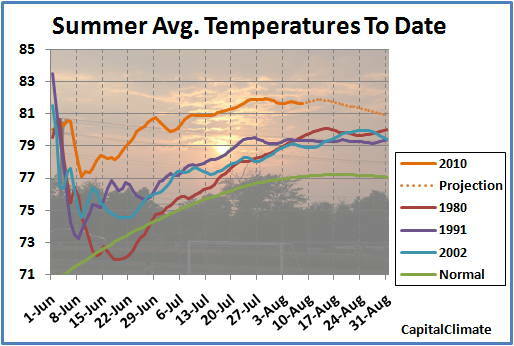 The cumulative average temperature so far this summer is now a toasty 81.7° for the 70 days of meteorological summer since June 1. This is 4.6° above the 30-year climatological average and an incredible 2° or more above each of the 3 previous hottest summers to date. 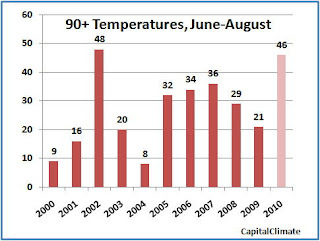 There has never been a summer in Washington with an average temperature above 80°, but with August so far averaging 80.7°, all 3 months this summer are above 80°. 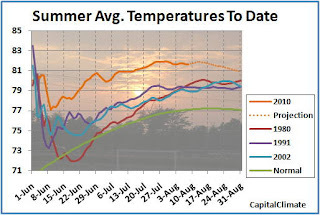 Using the National Weather Service forecast temperatures for the next 7 days and climatological averages for the rest of the month, the summer of 2010 would average 80.9°, nearly a whole degree above the old record in 1980. However, the extended outlook from the Climate Prediction Center calls for over a 60% chance of above-normal temperatures for August 15-19 and a 50-60% chance of above-normal for August 17-23. If this pans out, the final average could very well be higher.